The growing use and awareness of cannabis’ complex effects on the human body and mind, are closely related with the resurgence of the psychedelic culture and substances. The discussion about cannabis being psychedelic, though, is a very controversial one and more or less political in nature. On one hand, the definition of psychedelic substances is vague and permissive, but the general tendency is to consider psychedelic a powerful psychotropic substance much like psilocybin mushrooms, LSD, MDMA, DMT, ayahuasca and so on. And even in this class of strong mind-altering effects, the disagreement goes on as some dissociate between trance inducing plants and the chemically refined concentrates. The polemic is deeply influenced by the current medical interest, and from this point of view, the research on the benefits of cannabis targeted mostly its effects in treating physical conditions, whereof in the therapy of the mind its primary use is as sedative. This is doubled by its prime purpose as a recreational drug and the stigma of being abused as such. Such an approach is not only underestimating the value of the cannabis high, but it’s a poor understanding of the studies conducted on the plant that reveal an intricate relation with the human body. One of the most impressive discoveries was that we possess an endocannabinoid system that regulates the functioning of our organisms and displays inborn receptors that match the structure of the cannabinoids in the cannabis plant. In other words, we are designed to receive the cannabis effect at its full potential, which is dynamically transformative at all levels, physical, mental and spiritual. Maybe it’s time to look beyond the current outlook, beyond the mechanical method of research and usage, into our past, and revive the archaic tradition. Cannabis has been used for millennia in a holistic manner, which employed its therapeutic properties in cures for the mind, heart and soul, and which also praised its ability to connect our mortal beings with the divine. And the transpersonal experience, opening us to acknowledging and being actively communicating and interacting with a higher power, is what we most expect from a psychedelic experience. It is the blissful feeling of being one with all, of dissolution in all there is, and in the same time of being the most truthful ‘you’, utmost aware of your senses and receptive of their raw, direct perception, while filled with divine grace. For these precious gifts was cannabis used in rituals thousands of years ago, in an attitude of praise that regarded the recreational abuse of the plant as a lack of respect. And to this day, shamans that work with cannabis share the same of view, and invoke the spirit of the plant in a ceremonial setting. Both cannabis and psychedelics are influencing the serotonin and dopamine levels which gives the feeling euphoria, and are powerfully altering our perception of reality, while having the capacity to completely restructure our brains, not only in redefining its mechanisms but also its chemistry. Psychedelics bond directly to the 5-HT2A serotonin receptor while in the same time, they shut off a region of the brain (the Default Mode Network) that is usually concerned with worrying, daydreaming, and replaying events. The cannabis, on the other hand, is accessing the endocannabinoid system of the human body, which has the primary role of balancing our whole internal functioning. This type of interaction ensures an organic response, and further on, an integral assimilation of the effect of the experience. The synesthetic effect, so praised in psychedelics, is also present in the high of cannabis, juggling your senses, deepening their associations. What people usually miss out from cannabis is the hallucinations and for this reason they dismiss the rest of the benefits. What must be reckoned, is that, even though all hallucinatory substances are psychedelic, not all psychedelics are hallucinatory. Moreover, if you asked the curanderos of the Amazon you’d be surprised how little they think of the visions that we, Westerners find mesmerizing and all revealing, and how much deeper they dig beneath the phantasms, to find the true gift of the spiritual encounter. The most interesting aspect of it all is the huge difference in the potency of today’s cannabis and what you could have expected from this plant ages ago. This plant evolved interdependently with our needs, for we’ve bred it generations on roll, selecting and nurturing strains for different purposes, and our main concern at the moment is the concentration of THC. 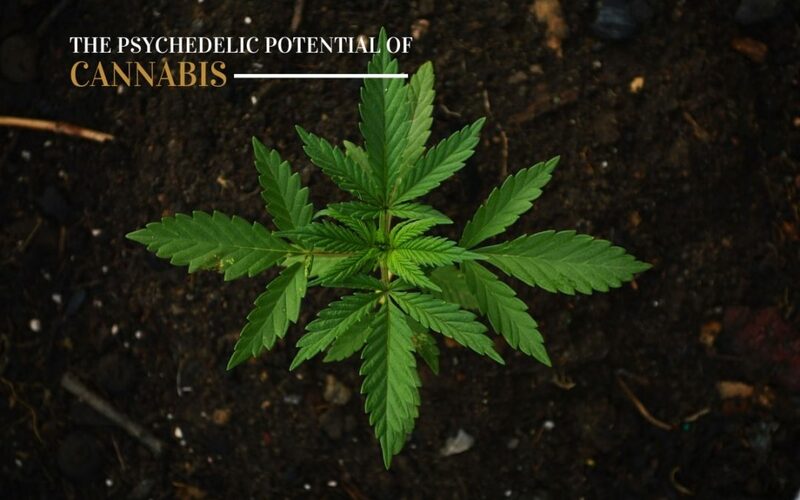 It is specifically this cannabinoid that makes out for most of the psychotropic effect of the plant, so we might say that nowadays we have more chances to use cannabis as psychedelic than our ancient ancestors. Thus to get the most out of what cannabis can offer, you’d better try extracts, and even better, edibles. When eaten, cannabis is processed by the liver into 11-hydroxy-THC which has a direct route to your brain and can induce hallucinations. But as in any spiritual endeavour, it is the intention that guides and conforms the whole journey. If you want to have a powerfully mind-altering effect, you have to welcome it with an open heart and mind, and prepare yourself, as well as the whole experience with the respect of a ritual. That means to look beyond the practical details, as strain, concentration of THC and so on, and see the energy that the plant comes with, focus on creating a peaceful environment and a pure intent for your experience. Cannabis is to this day employed in such trances, in self-discovery, creative and spiritual missions, by guides and shamans. And still, the plant is your guide, you just need to address it accordingly, communicate with it, let yourself be inspired by it. When wanting to get your mind blown to Alpha Centauri and back, Nirvanic Insights is your number one go to place.